Yesterday evening(April 7th) the celebs hit the grey carpet for the 54th Academy of Country Music Awards at the MGM Grand Garden Arena in Las Vegas, NV. Nicole Kidman was on hand to support hubby Keith Urban. She tends to chose hard to wear pieces and this time was no different. 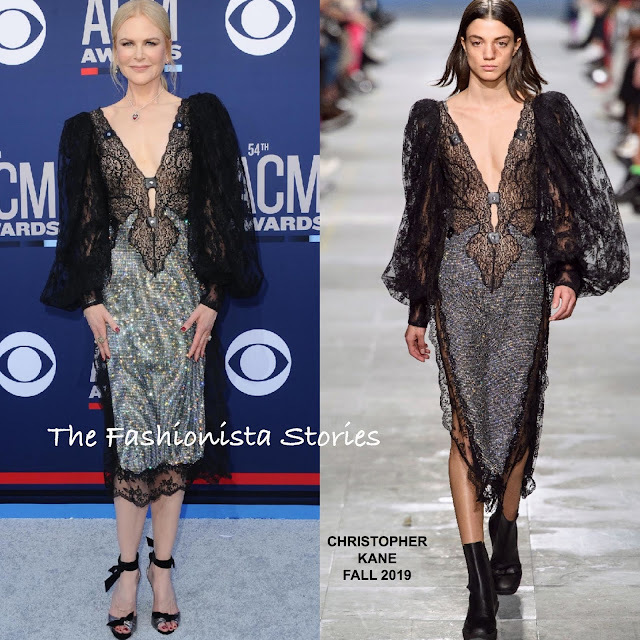 Her CHRISTOPHER KANE FALL 2019 black crystal lace & mesh panel midi dress. The v-neck was shorten on Nicole's dress which worked in her favor. The sleeves are weird and the dress is not the prettiest. However for some reason I like it and I can only see Nicole wearing this dress, no one else. Carrie Underwood worked the double split on her NICOLAS JEBRAN black & silver crystal embellished one long sleeve dress. I can't say that I am sold on her look, but I think it's the matronly hairstyle, which doesn't work with this sultry piece. Miranda Lambert stood out the most on the grey carpet due to her neon green ALEX PERRY SPRING 2019 sequin diamond halter top gown, which she accessorized with the BENEDETTA BRUZZICHES 'Ariel' rainbow clutch. Maren Morris served up major leg action wearing a CHRISTIAN SIRIANO FALL 2019 strapless lavender, ruffle mini dress, featuring a dramatic train in the back. Straight tresses and GIUSEPPE ZANOTTI sandals finished up her look. Kacey Musgraves who also attended the Variety Luncheon, worked a really cute ombre, pleated panel power suit from the CHRISTIAN COWAN x POWERPUFF GIRLS collection. 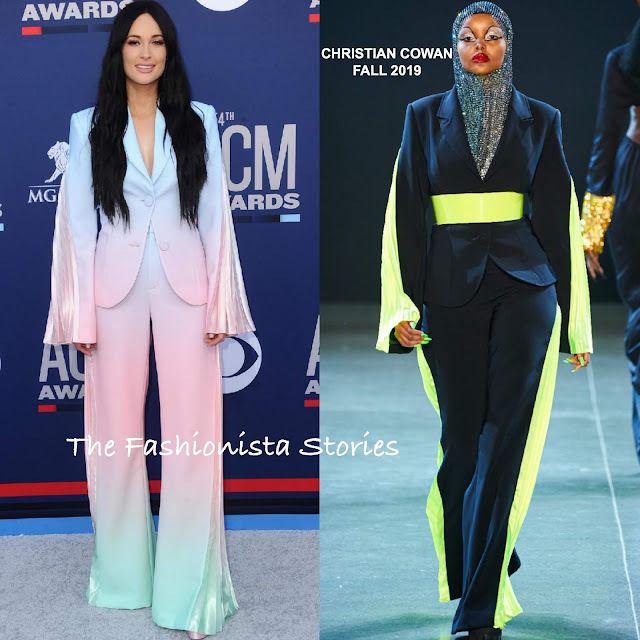 The suit was shown in the designer's Fall 2019 collection in a different color-way but I prefer Kacey's version. BRIAN ATWOOD platform sandals was styled with her look. Karen Fairchild of Little Big Town wore a SERGIO HUDSON FALL 2019 black embellished mini dress which she accessorized with NORMAN SILVERMAN jewelry, an EDIE PARKER clutch and CASADEI boots. For me Karen is not selling this sultry mini and while I am sold on the idea of boots with a mini dress, this particular style does not work for me. I feel like her & Kacey Musgraves(see above) should switch looks but Kacey looks great in that suit. Chrissy Metz who made her singing debut, looked beautiful wearing a custom ROXY EARLE color-block sequin dress, which was accessorized with ALEXIS BITTAR jewelry and STUART WIETZMAN sandals. Danica Partick also wore a sequin dress courtesy of ALEXANDRE VAUTHIER. Her orange draped dress, is an Vauthier signature, which we have seen before on the carpet. Love the color bu the RENE CAOVILLA sandals are not working for. A GUCCI bracelet and side parted tresses rounded out her look. Kimberly Schlapman wore a MISSONI black & gold sleeveless stripe dress, which was belted at the waist. A TYLER ELLIS clutch and her signature curls rounded out her look. 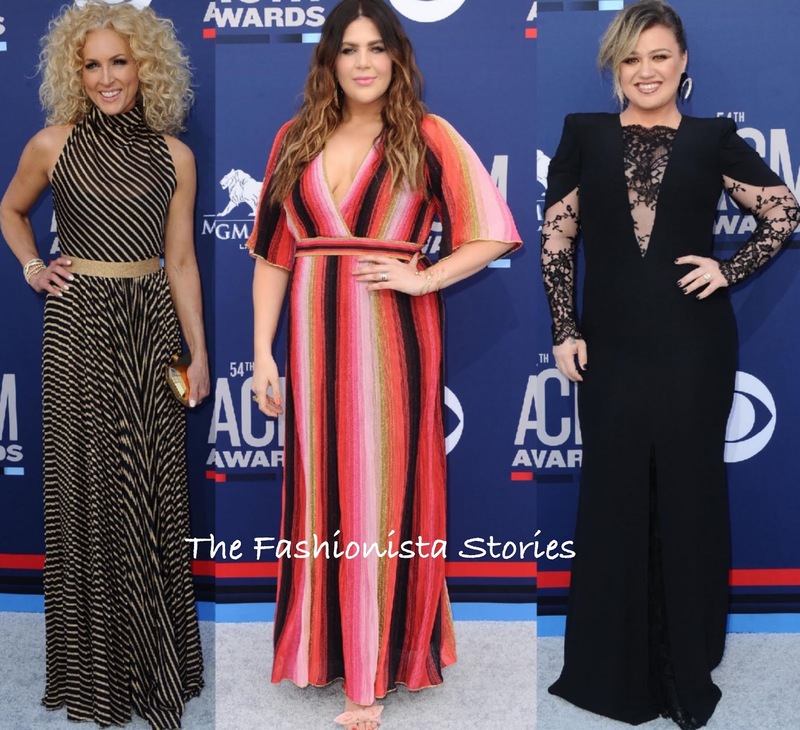 Hillary Scott also wore a stripe look from MISSONI. She offset her multi-stripe dress with pink bow detail sandals which topped off her look along with center part curls. Kelly Clarkson who hosted the event, wore a ALEXANDER MCQUEEN black lace panel gown, featuring and center front split. The idea of this dress is cute but if i had to change anything, it would be the neckline. It just doesn't work, the lace was only needed on the sleeves.